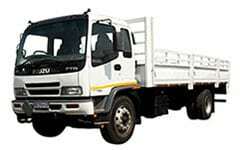 Drop Side Truck Rental - Power Truck Hire - Get a quote today! Drop Side Truck Rental - Power Truck Hire - Get a quote today! Our popular drop side truck rental fleet is available with load capacities of between 3 and 14 tons. All our vehicle are available to be rented on a daily, weekly and monthly basis. Please note that due to a high demand on our vehicles we cannot guarantee that the exact vehicle you see on the web page will be available, please confirm with your consultant. The displayed vehicle dimensions are used to give an indication to the size of our vehicles.